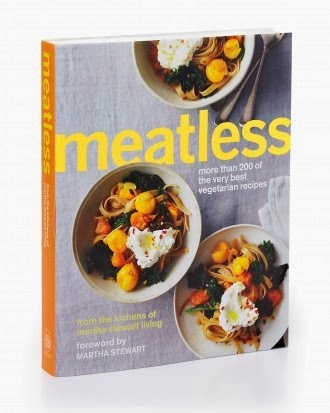 'Meatless' is a collection of recipes 'from the kitchens of Martha Stewart Living'. I expected a fairly random selection of material pressed into service to mop up some sales from a previously unconsidered market. I expected the photography to be first class. I expected the food to be fairly conservative. Beautiful cover, as you would expect. Over 200 recipes, and all of them photographed, mean that this is a nice chunky volume. There's a foreword where Martha herself says that her daugher renounced meat (but not fish) at an early age after having put two and together and come to the conclusion that the sudden disappearance of the family's pet sheep (which went by the name of Plantaganet Palliser) and the arrival of a small lamb chop on her dinner plate were not unrelated. Martha says 'Mother's age-old directive "Eat your vegetables" is still a very "Good Thing". Alanna Stang, the Editor-in-Chief (think I'll change my job title to that) at Whole Living, who possibly had more involvement with the recipes than Martha, follows up with an Introduction that says 'The plate is the place to celebrate plant foods' - not sure where else you would be inclined to put them. I know what they're doing is a good thing. Really I do. 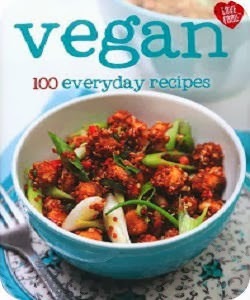 I want nice American ladies to share vegetarian recipes. But it all feels a bit bandwagon-jumpy so far. The first section of recipes is 'small plates to mix and match'. OK, I like that style of eating. What do we have? Little stuffed peppers, chickpea salad, a classic tortilla, hummus, eggplant dip, more variations on hummus. It's a bit predictable and what's really missing is any kind of character. I'd like more than a recipe - and much more than a cheesy intro ('It's hard to resist the combination of melted cheese... etc). I really want something interesting to read, something to inspire me, whether it's a snippet of well-crafted prose about food, a fascinating fact or two, a novel idea for customising the dish, or a bit of an insight into the author's life, like a personal memory or a suggested music track. But this book doesn't really have an author. Pages are turning rapidly. I pause at the roasted sweet potato salsa - quite like the idea of adding some body to the usual mixture of chopped tomatoes and avocados with some chunks of roast sweet potato. Nice. Sensible. Moving on, slaw, raw pasta made out of courgettes, seen it before. A salad with edamame, but in the picture doesn't show the smooth bright green beans I know. Ah! They've been roasted! Now that's quite interesting. Not sure if roasting edamame would make it nicer, it might just take away the freshness and the lovely green, and make them leathery on the outside and floury on the inside. I'll try it. Down to earth with a bump on the next page, avocado halves filled with avocado salad. A nice potato galette that you can pop under a salad, and then sweet potatoes stuffed with coconut, pomegranate and lime - too silly. More stuffed things follow, plus an omelette and a page of variations on bruscetta which feels a bit patronising. Things to put on toast. My interest is flagging. Next chapter, stovetop suppers. Some more omelettes. Stir fries. Vegetables with rice, with quinoa, with eggs. Another galette, this time with beetroot and carrots which make it very pretty. Lurking under a salad at a table near me soon, I predict. The chapter climaxes with some risotto variations. Soups, stews and chili. I like the look of the opening pic - something tomatoey and beany with a big sprig of rosemary. Tasty. No real surprises here though. There are poached eggs in the soup. A curry made with curry paste. Lentil soup with dried cherries looks as if it came from the same developer as the sweet potatoes stuffed with coconut, pomegranate and lime - just an unnecessary mixture. Variations on chili offers suggestions which include varying the beans, adding seasonal veg, and adding more chillies. Are the readers really that short of imagination? Casseroles and other baked dishes starts out with macaroni cheese, which isn't a great sign. I'm starting to think this is all about covering things with cheese until I get to the stuffed poblano chilies, which are mainly of interest to me because I taught a 'Flavours of Mexico' course at the weekend. These have a pureed tomatillo sauce. Looks OK. But oh, no, pasta shells stuffed with ricotta and spinach! Loads of what are basically vegetable crumbles. Stuffed mushrooms! And just when you thought it was safe... variations on a lasagne. Substantial salads opens well, with a combination of farro (which is just taking up room in my cupboard) and roasted grapes. Sherry vinegar, more rosemary... sounds really good. I'll try this one. Subsequent combos look a bit predictable, although as Martha's foreword points out, caramelised celery root is interesting. I seriously doubt whether anybody would thank you for bringing the shaved parsnip salad to the Thanksgiving table, as suggested. And I'm sorry, but squares of raw tofu cannot be used to stand in for mozzarella in a caprese salad. Just don't do it. Sandwiches, burgers and salads, and frankly I'm beginning to wonder when the quiches will make an appearance. I predict a chapter on quiches and tarts. Probably quiches, pies and tarts, these things tend to come in threes. Anyway. Sandwiches. Oh - how peculiar - here's a 'pizza' made in a frying pan and topped with Brussels sprouts and slices of lemon. It might be ... what's the word. Not exactly 'fun'. Clever-looking but not as tasty as yer cheese and tomato. Burgers made of brown rice, and blow me down if there's not one of those tarts made of a sheet of puff pastry. So much for the tart chapter theory. Here's a pizza made with hazelnut dough! I like that. There's loads of pizza in this section, I wonder why. Is a pizza just a variation on an open sandwich, perhaps? Pasta and other noodles. A cunning side-step away from the catch-all Italian section. Will there by any chance be a batch of variations on pesto at the end of this one? So, pasta with lots of other things. Ah - that's eye-catching: pinky-purple spaghetti which it turns out can be achieved by tossing wholegrain spaghetti with a puree of roasted beetroot and walnuts. Fancy. I was right about the pesto. Simple sides. Lord help us, I hope it doesn't get too simple. Interesting - asparagus mimosa is new to me, topped with a hard boiled egg that has been pressed through a seive. Looks pretty but my gut instinct is that this is not a nice thing to do to an egg. This chapter looks as if somebody has drawn up a list of vegetables and tried to dig out a recipe for each. Slightly disappointed when the roast grapes make a reappearance, it feels as if they are less special now. Again, I am not convinced that the dish with roasted Brussels sprouts and walnuts will sit comfortably on the thankgiving table, but I haven't eaten a lot of thanksgiving dinners, to be fair, so what do I know? A collection of things you can mash, and that's it for the recipes. 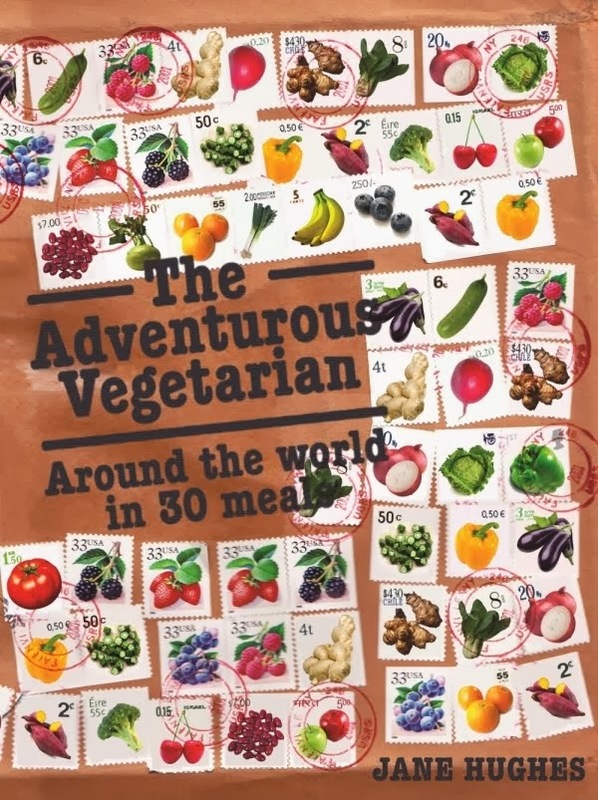 Now a lengthy section explaining what you might find in a vegetarian's cupboards. 'A cheeseboard is a lovely addition when entertaining.' How to boil an egg. Some suggested menus in really big type. Lovely bit of spot varnish on the inside back flap - now, that's class.